Researcher at the CONICET conducts activities that defend the reinforcement of the identity of native peoples by means of teaching and strengthening their language. There are several original languages that are still spoken all over Argentina. Unfortunately, some of them are endangered, but others manage to survive thanks to the everyday effort of their speakers to keep the ancestral bond of language between people and their territory. The Wichi language is a casualty of reality and the transmission of this language is decreasing from generation to generation. In spite of that, we can affirm that this language has unique characteristics that are transmitted through its complex internal organization which is not only based on a particular way to understand and organize the social-natural world; it is also a particular view of the world, a special understanding of the relationship between people and nature based on respect, shared spirituality and values lost in western societies. This language has been excluded from the school curriculums for centuries but thanks to the struggle of indigenous peoples and their belief that education was an alternative to preserve their culture; this language is present in schools. For many years, Wichi children were forced to attend a school in which their language was not spoken, hence they were considered as “silent children”. This reflects the ignorance of the community that surrounds them and does not conceive the fact that there are others that live and usually express themselves in another language. Our job is to train Wichi teachers to create a school with a respectful attitude towards differences. We are conducting a study on linguistics and bilingual education based on the training and support for these teachers in order to fulfil the dream of the communities: to have teachers that understand their children and provide them with support at school. However, there are not enough teachers and sometimes they live in isolation. Although the school has incorporated these teachers, they suffer daily discrimination and lack of school materials. Their task is really complex for them because they usually work far from their homes and people expect a lot from them. This project aims to study and support teachers and other members of the Wichi community through technical and financial help. The idea is to assist them in the production of teaching materials as well as in their tasks to revitalize their language for the children of the community in the province of Chaco. CONICET researchers and teachers-researchers at the Centro para la Investigación y Formación para la Modalidad Aborigen (CIFMA) [Centre for Research and Training for Aboriginal Modality] of the province of Chaco, participate in this project coordinated by Virginia Unamuno, CONICET independent researcher at the University of Buenos Aires, and Camilo Ballena, professor of Wichi language at the CIFMA. 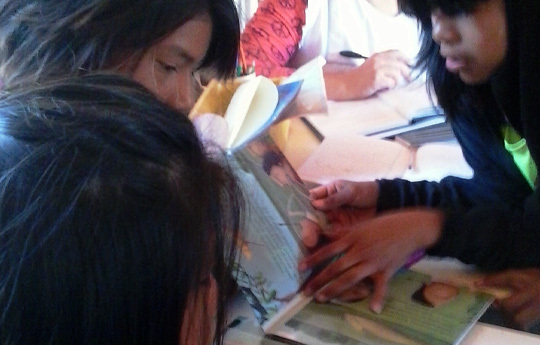 Since 2011, there have been workshops for collective production of materials with the participation of teachers, children and other members of the Wichi community from the region of Bajo Bermejo (south to the Bermejo river). As a result, different books, posters and educational games for bilingual and intercultural teaching have been published. The workshops focus on practical bilingual education and indigenous perspectives to improve the school experience of the students. In 2012, the Wichi Lhomet imprint was created. It conducts several projects for the publication of studies of Wichi people interested in telling their story, view of the world, literature and music. Likewise, it aims to improve education and include different traditional knowledge at school. In 2014, we began to record an album to promote the work of aboriginal musicians and poets that at the same time will provide teachers with written educational material in that language. Recording the album. Photo: courtesy researcher. The album includes songs composed by two Whichi singers that are recognized by their community in the field of music, literature and teaching. Apart from having the translation and interpretation of the Argentine National Anthem in Wichi, this unique album collects the work of songwriters who experiment with various musical genres. *Virginia Unamuno holds a PhD in Philology. She has a degree in Linguistics and Sociolinguistics. Furthermore, she specialized in bilingual education and is a CONICET independent researcher. Josefa Ballena lives in Sip’ohi (El Sauzalito), province of Chaco. She is a singer, poet, mother and bilingual teacher. Ballena has composed various songs that can be listened to on Wichi radios. The Wichi version of the Argentine National Anthem has been interpreted by her. Ballena’s poetic and vocal work stands out for its exquisite beauty. Joel Ballena lives in Sip’ohi (El Sauzalito), province of Chaco. He is a father and musician. For many years, he has combined music with education for Wichi students. He participated in various projects for the promotion of the Wichi language and culture, and is a member of Los del Sip’ohi group, who have released three albums with popular and folk music. Camilo Ballena lives in Sip’ohi (El Sauzalito), province of Chaco. He is a researcher in the field of Wichi language and an activist regarding its use and promotion. He is a father and bilingual teacher. Currently, he trains teachers of Wichi for primary school. 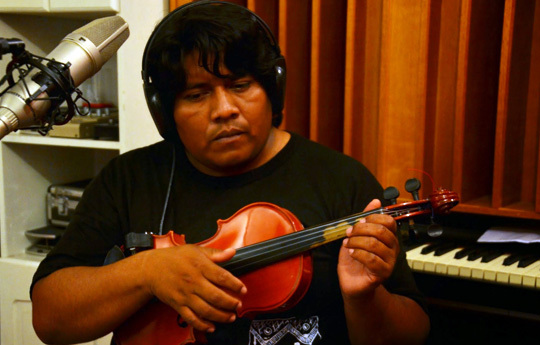 Ballena is a musician and poet widely known to Wichi people specially because he was the composer of Sip’ohi, a song that is like an anthem for Wichi people of the province of Chaco. As well as his brothers, he has participated in various projects for the dissemination of Wichi language and culture. Ballena is a member of Los del Sip’ohi group, who have released three albums with popular and folk music.